You'll find plenty of places to visit near Sydney: Blackheath (Day FIne Art & Gallery Blackheath), Katoomba (The Three Sisters, Wentworth Falls, & more) and Norman Lindsay Gallery & Museum (in Faulconbridge). Spend the 17th (Thu) exploring nature at Sydney Harbour National Park. Spend the 23rd (Wed) exploring nature at Kanangra-Boyd National Park. 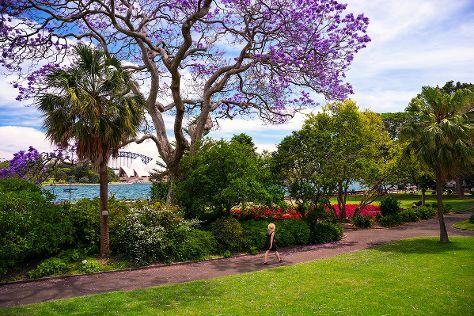 There's lots more to do: admire the natural beauty at Royal Botanic Garden Sydney, enjoy the sand and surf at Bondi Beach, admire nature's wide array of creatures at Sea Life Sydney Aquarium, and tour the pleasant surroundings at The Opera House to the Botanic Gardens Walk. If you are flying in from United Kingdom, the closest major airport is Sydney Kingsford Smith International Airport. In October, daytime highs in Sydney are 28°C, while nighttime lows are 17°C. Finish your sightseeing early on the 24th (Thu) so you can travel back home.